It wasn't long ago and it seemed like everyone was writing off Best Buy - excess retail square footage, salespeople (if you could find them) more interested selling extended warranties than the right product or service. Combined with senior management turmoil and accumulating losses, the writing appeared to be on the wall. Just like digital photography made film obsolete, personal PC's and printers made typewriters obsolete, Amazon positions itself (in each category it chooses) to render brick and mortar retail obsolete! Or, maybe not? 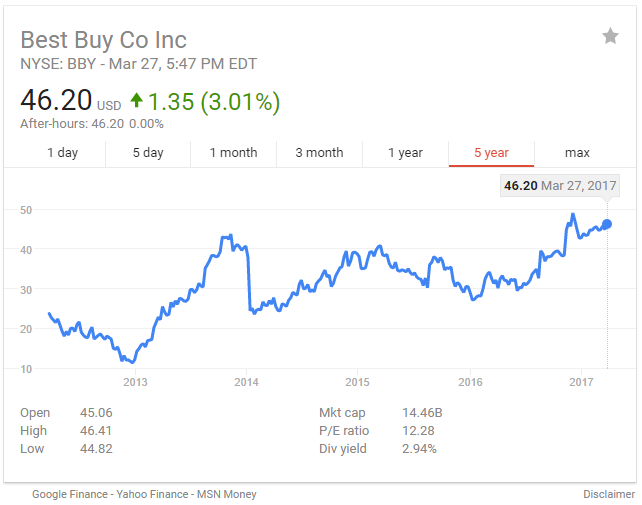 Best Buy's March 27, 2017, share price of $46.20 represented a 5-year high and was close to its 10-year high. Who would have thought? Back in December 2012 its shares were at a 20-year low of $11.29, the ever-increasing threat of Amazon loomed, and there was the recurring analyst theme that they had become no more than a showroom for consumers to "touch" the product they were interested in, before leaving the store and purchasing what they wanted online. Many predicted Best Buy would not survive as it faced the ever-increasing might of the Amazon e-commerce machine. Move forward five, short years and consider Best Buy's new tagline: "Expert Service: Unbeatable Price". Need to call Amazon for customer service and you'll probably end up having to do a Google search to find a number to do so. On Best Buy - one click from their homepage provides multiple options including a toll-free number with 24/7 customer service. Best Buy have invested in technology. They've invested in their website, their access to business intelligence on pricing, and in expert knowledge of the products they sell. They've trained their salespeople to deal with customer requirements and ensure they're able to match the best fit to their needs. In the new age of inter-connectivity and complexity, they recognized and responded to consumers need for face-to-face help when finalizing their purchase decisions. Along the way Best Buy has demonstrated how to compete with Amazon! Operationally, they reduced overhead cost while investing in knowledgeable in store salespersons. Focused on technologies where consumers need expert advice. Supply chain management, utilizing stores as DC's - order online and promote in-store pickup, order online or, deliver quickly from a nearby store that's now doubling as a distribution center. Business intelligence - competitors sell prices. Friendly, knowledgeable sales people armed in-store with this intelligence - empowered with price matching policies to ensure a consumer doesn't have a reason to leave the store and buy from an online competitor. Leveraging this business intelligence to ensure they have negotiated the best terms from their vendors. Sure, competition can sell at a loss to try and win market share (think Amazon) but, not forever. Best Buy has over 1,000 retail stores throughout the United States which are now starting to be leveraged as fulfillment centers alongside their role as traditional retail outlets. Not only have they enabled themselves to compete on price and speed of delivery, they have combined this with knowledgeable face-to-face consumer engagement both inside and outside the store. Business transformations don't happen overnight. Best Buy's hiring of new CEO, Hubert Joly in 2012 was just the start. He moved quickly, cut costs, and bought time. He's still got a long way to go and the longer-term outcome may still be uncertain. Although Amazon remains a considerable threat as the only competitor positioned to fund long-term losses to win market share, Hubert Joly has put his company in a fighting position for survival when many counted it down and out. At least the playing field is leveling as 75% of Amazon consumers now have to pay the state sales taxes they'd long been able to avoid. How can all this be relevant to small business and sales channel development and our ongoing focus on independent resellers and their opportunity to leverage aftermarket office supplies? The Amazon marketplace and the disruptive threat it represents to the office products and equipment industry leave most resellers fearful for their future. Best Buy recognized the threat Amazon presented to its business model, brought in new management, reduced costs, bought some time, and started to execute their business transformation. This meant changing the way they conducted business. It meant leveraging technology and it meant demonstrating their leadership in terms of their knowledge of the increasingly sophisticated products they were selling. They leveraged their excess retail square footage placing stores within stores and, by directly introducing expertise from original equipment manufacturers such as Microsoft, Samsung, and others, they put even more experts in front of their customers. They figured out how to leverage business intelligence to price their products, to have the confidence to price-match their products, and to ensure they were purchasing at the very best prices. They also figured out how to use technology to provide comparable delivery service options as those available from Amazon. They upgraded their website, improved search capabilities, and the shopping and check-out experience. They started to leverage digital technology to "touch base" with their customers post-sale, make relevant offers for other products they may be interested in, as well as to check they were satisfied with recent purchases. In short, Best Buy built a lifeline to defend themselves against the Amazon juggernaut, structured themselves to eliminate customer friction points, and earned themselves a reprieve. This doesn't make what they have to continue to do easy, or guarantee the long-term outlook but, at least they woke up and started to fight for their future. Five years ago, few would have put money on them being able to do so. However, despite numerous parallels to the Best Buy circumstances, they are not, by any means, complete! Best Buy is a powerful organization with nearly $40 Billion in annual sales. Despite making huge losses in 2012, they still had the financial resources to cut costs and the confidence to invest in the right people and lay the foundation for their transformation. Independent office products resellers are not powerful corporate entities with access to significant funds for engineering complex, expensive turnarounds. Many times, their revenue and margins are decreasing in a competitive, shrinking industry. Many may feel it's too late and too difficult to figure out and implement a turnaround strategy. However, for those that choose to do nothing and elect to avoid taking on their pressing issues, the outcome is not going to be favorable. The business environment is in a constant state of accelerated change and failure to adapt, and then keep up, is likely to lead to business failure. The purpose of this article has been to try and show that, despite enormous challenges, Best Buy has been able to implement a strategy to improve their business outlook. They've accomplished this despite many years being in the cross hairs of the Amazon threat. Just like it had been for Best Buy in 2012, the future for independent resellers has been deteriorating for a number of years and many observers are pessimistic for their outcome. Other brick and mortar retailers, such as Walmart, Target, and Home Depot, are seeing the success Best Buy has had and are also working hard to transform their own businesses. They all face threats from Amazon and they're all deploying similar tactics to those adopted by Best Buy, with a strong focus on knowledgeable, personal service and technology. There's no reason why smaller entities, despite having vastly limited resources compared to Best Buy and the like, can't start down similar paths and develop more favorable prospects for the survival of their businesses. Amazon has changed the game - they reduced prices and they improved the service, and customers responded favorably to both. If office products incumbents don't respond and accomplish the same, they will go out of business and miss the chance to participate in their own office products growth opportunity. If you missed the recent eight-part series from E and S Solutions on the office supplies aftermarket tipping point, please check out our new eBook, it's just published, it's FREE, and it contains a thorough examination of the office supplies industry and a path to the $20 billion growth opportunity for independent resellers.